The Rashtriya Swayamsevak Sangh (RSS) has big plans to strengthen their base in Bengal. And this ideological fountainhead of the Bharatiya Janata Party is focussing on Dalits. To woo Dalit Hindus, the state unit will take out rallies across the state. This was decided at RSS' All-India Conference in Siliguri on Thursday. Sangh National General Secretary Suresh 'Bhaiyyaji' Joshi was present there. The organisation said it would highlight "atrocities perpetuated on Dalit Hindus". The call fits into the bigger picture of BJP's all-India plan to increase its appeal among Dalits before the 2019 polls. Senior RSS leaders claimed there were several cases of atrocities perpetuated against Dalit Hindus by Muslims in Canning in South 24 Parganas district. A list of such incidents have been submitted to Joshi. Though the National Commission for Scheduled Castes (NCSC) visited the area and spoke to victims, the police were yet to lodge an FIR, the leaders said. “We have been instructed by Joshiji to unite all Dalit Hindus. So, as the first step we have decided to visit each Dalit Hindu household and speak with them to get an idea about the problems they are facing,” said a senior RSS leader from the Bengal cadre. Joshi is scheduled to be in Bengal until 28 October and meet RSS leaders and members at different 'sakhas'. 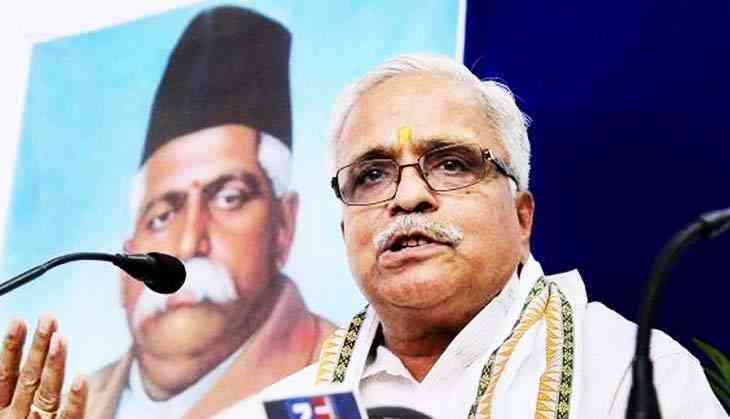 “On Friday Joshiji is scheduled to speak with various senior RSS leaders in the state and will be discussing issues they might be facing while executing projects here,” general secretary of West Bengal RSS, Jishnu Bose, said. The RSS claimed nearly 20% of Bengal's Dalit Hindus suffered atrocities but haven't been able to raise their voice. According to a Sangh source, the BJP will try to mobilise each Dalit caste individually. If the RSS manages to unite all Dalit Hindus it would make things easier for the saffron party. Significantly, this is not the only state where the RSS are wooing the Dalits. In northern and western India, RSS has already launched several campaigns to unite the caste and have even organised community meals, called the Samrastra Bhoj, for them. They have also opened schools in various Dalit settlements in Maharashtra. “RSS can conduct various campaigns to strengthen their base in West Bengal. We are not perturbed. They have already convened various meetings in Bengal earlier, but they were unable to divide Bengal on communal lines,” state parliamentary affairs minister, Partha Chatterjee, said. Chatterjee pointed out that those who are speaking for Dalit rights now in Bengal have been attacking Dalits in other states. “Dalits are being beaten up by BJP goons in various states across India,” he added. “RSS is free to organise campaigns in various districts to strengthen their base, but it needs to be seen that they are not carrying out any illegal activities and trying to divide Bengal along communal lines,” CPI(M) leader Sujan Chakraborty said.